Want to book your car rental in Greece and the islands? This is the right place! Plan a road trip to the most beautiful places of the Greek mainland or rent a car for your holidays in the Greek islands through Greeka.com. We cooperate with dozens of car rental agencies conveniently located in Athens, Thessaloniki, other Greek cities and the most popular Greek islands. We have carefully selected these partners to make sure that we provide our clients with the highest car rental quality service in Greece. As we cooperate with car rental agencies in Greece for many years, we have also negotiated the lowest prices for their cars, which is why we can offer our clients maximum discounts up to 25%. Be sure that our prices are the best you can find in the market! Learn how it works. 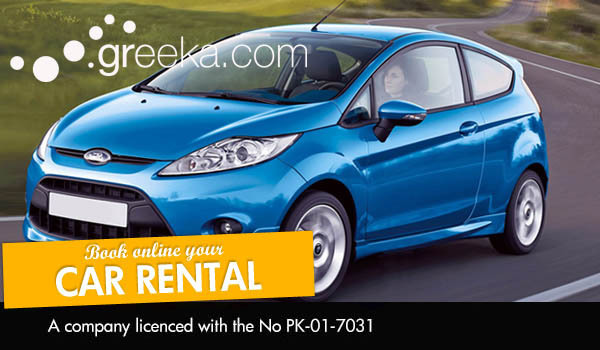 Why book your car rental with Greeka? Greeka.com can help you get to the most popular archaeological sites, picturesque villages and beautiful beach destinations in the country. Use our application to search for a car rental in Greece. We offer incredible car rental deals with LDW insurance and unlimited miles. Available extra options include additional driver, extra child seat and GPS system. More options or extra insurance can be asked directly at our local partner upon car pick up. You can have the car rental delived at the airport, port and hotel, or you can pick it up yourself from our partner's central office. Rent a car in Greece through Greeka.com and choose among luxury vehicles, jeeps, vans, normal passenger cars and small cars. Driving a car rental in Greece is certainly the most convenient way to see the country's attactions, fabulous coastlines and landscape. Greece has a well-maintained roadway system that makes it quite easy for travelers who rent a car. The highways from Athens to Thessaloniki and from Athens to Corinth, Tripolis and Kalamata are excellent, while northern Greece is crossed by the recently-completed Egnatia Road. More highways are under construction, for example the road from Corinth to Patras. The most challenging parts of driving a car hire in Greece are the narrow roads in the countryside and in the Greek islands. These roads usually have one line per direction and they are windy due to the mountainous landscape of the country. You are adviced to drive slowly in these roads, keep the speed limits and pull over to allow oncoming traffic from local cars. Also in the highways, keep cash on hand for paying tolls. Toll rates are about 2.5-3.5 euros for a normal passenger car. Certainly it is illegal to use the cell phone while driving and you may be stopped and fined if you violate this law. As for parking your car rental, better make sure that your hotel has a parking space because on-street parking may be hard to find in large cities or during high season. Select the pickup and dropoff dates & hour for your car. 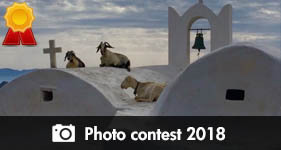 Greeka.com specializes in Greece and the Greek Islands serving thousands of travellers every day. The collaboration with selected car rental agencies all over Greece enables us to continuously monitor the market and thus offer you the lowest prices in the market. Greeka.com is NOT a car rental company and by using the online reservation system of our site you contact and pay directly the local car rental agency. This online reservation system does not constitute in any way contract for the provision of car rental services. The contract enters into force at the time of the car rental and Greeka.com is not liable to the hirer for any loss, cancellation, damage, alteration, accident, delay, injury, irregularity suffered, or any additional expenses incurred by the hirer whatsoever. 1) You select the pick-up point. 2) As soon as you set the dates and the pick-up point, a new page showing the cars available for the selected period, as well as the total cost of the rental will open. Note that all rentals are calculated on a 24-hour basis. However, you are allowed to return the car up to 1 hour later without being charged for an additional day. More than 1 hour delay counts as an additional day. 3) Choose from the options available. 4) In order to receive a confirmation page for your order, you must accept the terms and conditions and provide us with all the necessary personal data. The down-payment required by our partner appears in this page. As soon as we receive your order, our rent a car partner will be informed and he will accept it or not depending on the availability. This is the reason why making your reservation some time in advance is important, especially during the peak season of August. In order a reservation to take effect, a reservation fee of 3 euros is required. The reservation fee will only be RESERVED in your account until the final confirmation of the booking. In case a booking is not confirmed, the reservation fee will not be deducted from your account. In case the booking is confirmed, the reservation fee and the down-payment will be deducted from your account by Greeka.com our rent-a-car partner respectively. The final confirmation/voucher for the reservation will be sent via e-mail, so make sure that the e-mail address you provide is correct and the amount for the down-payment is available in your account. Normally, you will receive a voucher within 1-3 days with instructions for the delivery and telephone numbers. The balance has to be paid upon delivery of the car either by credit card in the name of the driver or in cash. Most car rental companies require an additional credit card guarantee of about 100-300 euros depending on the pick-up point and the category of the vehicle. The currency shown on our web page is shown with the exchange rate of the actual day of booking. The deposit is charged in euro and the currency conversion serves ONLY as a guideline. What is covered by the third party insurance? The insurance amounts varies for each destination. What is covered by CDW (Collision Damage Waiver) insurance? The Collision Damage Waiver covers any damage caused on the rental vehicle regardless of who is at fault. What is covered by the insurance against theft (TP)? Insurance against theft covers the theft of the vehicle, but not the luggage or any valuable property inside the vehicle. FDW is the short form for Full Damage Waiver, which reduces the excess amount the renting person may be obliged to pay for collision damages. Although we do our best in order to reserve a specific type of vehicle, we are unable to guarantee a particular make, model or fuel of car. Reservations are confirmed based on the vehicle category and not on the car model. The cars named in the webpage are shown suggestively for the size and the performance of each vehicle category. The local car rental partner on site reserves the right of providing a vehicle of higher category in case the vehicle category booked is not available. In case of booking a prestige car, the specific car booked is guaranteed. The possibility of hiring a car out of normal working hours is available in most places. However, in this case, there may be an additional charge, which you are able to see once youve filled in the booking details. Information on how getting your car with the voucher. -a car rental desk located at the airport. -a representative that will meet you with your name on a sign and the car at the airport/port etc. -a shuttle bus that will bring you to the nearest rental station where you will get the car. When picking up your car at the hotel, either the car will be delivered or a shuttle bus will bring you to the nearest rental station. Collection is normally at the airport or local office. The drivers minimum age is 23 years old; however, the minimum age limit may vary depending on the vehicle category. The age limits appear on the page with the available cars. All drivers must produce a full driving license held for at least one year. Detailed information can be found under "Local Terms and Conditions". Any change of a car rental booking involves its cancellation. You have to first cancel your previous booking by following the link that is located in the e-mail you received. For cancellations made at least 5 days (120 hours) prior to arrival there will be no charge and your down-payment will be refunded. If the cancellation is made in less than 5 days (120 hours) prior to picking-up, your down-payment will be kept by the car rental company in order to compensate the reservation. Please read local terms for any extra charge. 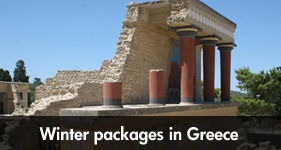 Please note that the reservation fee of 3 euros is always kept by Greeka.com with the confirmation of each order. Cancellations/ Changes after the starting of the rental period will be handled locally by the car rental partner of your location. Greeka.com is not responsible for any changes in pricing that may occur. No refunds will be made for no-shows at picking-up point or failure to produce the relevant documents including driving license, early returns or cancellations after the rental starting date. Normally there is no refund for any unused rental days, but it depends on the car rental company to decide whether there will be any refund or not. - VAT and all local taxes. Throughout the steps in your booking you are able to see the price of the car rental as well as costs for any extras that may apply. Greeka.com has never and will never sell, rent or lease personal information collected at the site with any third-parties. The personal information collected in our websites is never out-sourced to third-parties but remains under our control at all times. The information is sent to third-parties that are car rental agencies and only in order to complete the booking arrangements requested on users behalf. 1) Pick up: You select the pick-up point. 2) Select vehicule: As soon as you set the dates and the pick-up point, a new page showing the cars available for the selected period, as well as the total cost of the rental will open. 3) Options: Choose from the options available. 4) Payment: In order to receive a confirmation page for your order, you must accept the terms and conditions and provide us with all the necessary personal data. This page is secured (you may check the security certificate) and all data is encrypted. The down-payment required by our partner appears in this page. In order a reservation to take effect, a reservation fee of 3 euros,as well as a down-payment are required. These payments will only be RESERVED in your account until the final confirmation of the booking by our car rental partner. Booking not confirmed: In case a booking is not confirmed for any reason, the payments will not be deducted from your account. Booking confirmed:In case the booking is confirmed, the reservation fee and the down-payment will be deducted from your account by Greeka.com, so make sure that the amount for the down-payment is available in your account. A confirmation voucher for the reservation with details on the delivery of the car will be sent to you via e-mail within 72 hours, so make sure that the e-mail address you provide is correct. We have no knowledge on the car rental company that will confirm your booking until its confirmation. The name of the car Rental Company, delivery instructions and telephone numbers will be written on your voucher. No confirmation: In case none of our car rental partners can confirm your order for any reason, a cancellation e-mail will be sent to you with suggestions on changing your order; no payments will be captured from your account. In case the booking is confirmed, the reservation fee and the down-payment will be deducted from your account by Greeka.com. The final confirmation/voucher for the reservation will be sent via e-mail, so make sure that the e-mail address you provide is correct and the amount for the down-payment is available in your account. Most car rental companies require an additional credit card guarantee of about 200-600 euros or higher in case of luxury car rental- depending on the pick-up point and the category of the vehicle. A valid credit card in the name of the main driver must be presented as a guarantee for the rental. Always ensure that the card has sufficient credit available at the time of rental. The amount authorized is generally the insurance excess shown in the Terms & Conditions. For pick-up in ports, the name of the ferry and arrival time is required. For hotel delivery, the name of the hotel and -if available- the telephone number and address of the hotel, too, are required. If this information is not available at the time of booking, you have to inform our partner about these details at least 3 days before the rental start date either online or by phone at the number appearing on your voucher. If this information is not provided in time; Neither Greeka.com nor its car rental partners can accept responsibility or compensation for a failed rental. The possibility of getting a car out of normal working hours exists in most locations; however, an additional charge for out of hour service may apply. In case the car pick-up to falls outside normal working hours due to a flight/ ferry delay or for any other reason, the additional fee is charged locally, where the out of hour service is available. In case of pick-up at a hotel, there are two possibilities; either the car will be delivered there, or a shuttle service will bring you to the nearest rental station. An additional charge may apply for delivery and collection; youll be informed on booking if applicable. In case you have any problems finding the car rental company, you have to call at the number/s on the voucher under Rent A Car Phone". In case you wish to change the drop off details, provided that these changes are made acceptable by the car rental company, there may be an extra charge. The drivers minimum age is 23-25 years old, and the maximum is normally 75 years old. The age limits appear on the page with the available cars and in the local terms and conditions for your selected destination. At some locations, paying an additional fee may reduce the minimum and/or maximum age. Drivers are required to produce a full driving license held for at least one year. Additionally, a valid passport or ID card has to be presented at the pick-up of the vehicle. It is the drivers responsibility to ensure that he/she has the appropriate driving license; International drivers license is required for non EU citizens. No refund is given for rentals rejected due to non-production of a valid driving license and a maximum amount of 1 day rental can be kept by the car rental company. Facsimiles/photocopies of licenses are not acceptable. Rental days are calculated on a 24-hour basis, starting at the time shown on the voucher. Greeka.com and its car rental partners allow up to 1 hour delay in the time of returning the vehicle without counting an extra day. In case of a flight delayed etc we/our car rental partners allow a change in the time of delivery of up to 1 hour, meaning that your rental period starts counting 1 hour later than on the reservation. There will be no extra charge for this except in the case the out of hour charge applies. In order to make a modification, you have to cancel your initial booking in order to make a new one. If the modification is made at least 5 days prior to delivery, the down-payment is refunded. The reservation fee (3 Euro) is kept for administration costs. It depends on the car rental company if any refund can be made for any unused days. All cancellations are made through the customer log in page. Normally we do not accept cancellations by phone. For cancellations made at least 120 hours (5 full days) prior to the rental period start, the whole amount of your down payment is returned and there will be no additional costs, except the reservation fee (3 Euro) and those that may occur due to exchange rates. For cancellations made 120 hours (5 full days) or less prior to the rental period start, the down payment is not refunded. Furthermore, there is a maximum amount of 1 day rental that may be charged on your credit card by the car rental company to compensate for their costs. You have to contact directly the car rental company to ask if they will charge you that amount of 1 day rental or not. For No Shows, a maximum amount of 1 day rental can be kept by the car rental company. The deposit can't be refunded. Please note that the reservation fee (3 Euro) is not refunded for a confirmed order. Cancellations/ Modifications after the starting of the rental period are handled by the car rental company at your destination. Greeka.com is not responsible for any changes that may occur in pricing. No refund is made for no-shows at the destination, failure to produce the appropriate documentation, early returns or cancellations after the rental start date. Normally no refund is made for any unused days. However, it depends on the car rental company to make any refund in case of unused days. In case of a cancellation, either after the client's decision or because of any possible problem that may occur, our company is not responsible if the exchange currency has changed and the client is refunded with less or more money. The car rental voucher should be presented at the pick up point. Greeka.com is not liable for rentals rejected in case a voucher is not presented. Please keep the rental documents and all related receipts for a minimum of 28 days after returning the car. The rental agreement is written in Greek and in English and includes the terms and conditions of the car rental agency that needs to be studied before being signed. Greeka.com will not be held responsible after they are signed in case of any differences with the general and local terms accepted before proceeding to the car rental order. Although Greeka.com makes every effort in order to reserve a specific type of vehicle, we are unable to guarantee a particular make, model or fuel of the car. Reservations are confirmed based on the vehicle category and not on the car model. The cars named in the webpage are shown suggestively for the size and the performance of each vehicle category. Each car rental company has different policy regarding fuel. Please check the car specifications as Greeka.com cannot accept responsibility in case the vehicle booked is not large enough to fit all passengers and luggage on arrival. Our car rental partner reserves the right to refuse to provide a car to any customer who is, in their opinion, unfit to drive or does not meet eligibility requirements. He also reserves the right of providing a vehicle of higher category in case the vehicle category booked is not available. In case of booking a prestige car, the specific car booked is guaranteed. In case you are not satisfied in any way with the standard of your booked car, you SHOULD contact the car rental company AS SOON AS POSSIBLE. Such situations are to be handled with the local car rental company. Failure to do so may result in claims being rejected or unsettled. Greeka.com assumes no liability for actual rentals that do not take place due to reasons for which the hirer is responsible. - failure to present a drivers license or presenting a drivers license which is no longer valid. - failure to present a valid passport or identification card. - failure to present a valid credit card (debit cards only rarely accepted). - non-compliance to the regulations regarding the minimum or maximum age. The terms and conditions as well as the rental agreement signed on pick-up are governed by local laws and are legally binding on the hirer. All reservations are made by Greeka.com and all coupons and vouchers are issued by Greeka.com. Greeka.com is just an intermediary, NOT a travel agency, and thus is not liable to the hirer for any loss, cancellation, damage, alteration, accident, delay, injury, irregularity suffered, or any additional expenses incurred. Greeka.com is liable for any losses a client suffers as a result of Greeka.com breaking this agreement in case the losses are a consequence that could have been foreseen by Greeka.com. Greeka.com is not liable for any indirect losses that happen as a side-effect of the main loss or damage, which could not have been foreseen by the client and Greeka.com (such as loss of profits or loss of opportunity). Greeka.com is not liable for either a failure to perform or delay in performing any of its obligations under this booking agreement in case a performance is delayed, hindered or prevented due to force majeure, meaning any event beyond the reasonable control of Greeka.com, such as natural disasters etc. - Child seats: Due to insurance rules you are required to fit the child seat yourself. - Across border rentals: Not allowed. - Ferrying the rented car: Ferrying is normally allowed within the same country, but must be requested at the local agency. You should always inform the car rental company when taking a car on a ferry. - Third party insurance, covering the third person against property damages and body injuries. - CDW (Collision Damage Waiver). - Fire insurance (in most locations). - Theft insurance (in most locations). For more information, please refer to the "Local Terms and Conditions". The insurance policy will be managed with local agent and everything will be written on the contract you will sign. At the destinations where you are required to leave an excess deposit, most of our car rental partners offer an extra insurance covering the excess amount. In case you have an accident or you cause some damage during the rental period and if the renter is responsible of this, then our car rental partner will ask you to leave a deposit to repair this damage. If the accident is proven not to be the renters blame, then you will not be required to pay for it. Depending on some destinations, car categories and renting seasons, Greeka.com shall fully compensate the client for any amount of money that has been paid to the rental company for a damage caused by him. There are some exceptions to this rule, presented in the section Exceptions to an All Inclusive Insurance. Have in mind that you can get refunded only if your voucher mentions Full insurance: excess refundable from Greekacom. 1. Immediately inform the car rental about the accident or the damage. 2. If you have an accident or have caused some damage, call the police at the accidents area to give you a written report. 3. Then go to the car rental office and make an accident (or theft, if this is the case) report. - the receipts of payment and the statement of your credit card, to prove that our partner has charged you for the damage. If you do not send these documents to Greeka.com or if any of these documents is missing, then Greeka.com shall not refund you. Moreover, the client shall not be refunded if the accident/ damage were caused by not complying with the terms and conditions, as presented in our web page and/or the car rental agreement. The conditions of the car rental agreement are legally binding the renter. There are some destinations where you will have to pay an excess amount to buy some extra car insurance. Greeka.com releases you from such an obligation, as we shall refund you for any amount of money excessively paid. However, if you wish to, you can buy an extra insurance just to avoid any excess amount payments to the rental company when you reach your destination. 1. antennas, mirrors, lights, windows, windshield wipers, loss of registration plates. 2. trays, hubcap, gas cap, wheels, tire punctures, burst tires, fuel errors, lack of electricity because of forgotten turn on electrical devices. 3. car jacks, damage to the car locks, loss or damage of keys or spare key, warning triangles. 4. damage or extreme dirtiness to the exterior or the interior of the car, underside damage, damage to the seats or child/baby seats, theft of car accessories or personal belongings that were in the rented car. Moreover, Greeka.com shall not compensate the client for any damage caused by negligence. We may consider as negligence any damage unnoticed by the driver. Such damages also have to be paid by the client himself. Furthermore, the insurance doesnt cover any damage caused during the transport by ship or other means, any accident that happened while the driver was under alcohol/ drug influence or caused purposefully and any accident caused by violation of the traffic law. Towing costs are also not covered by the insurance company. The car rental is not obliged to replace a flat tire or repair damages on the radio. Greeka.com shall not pay for any telephones, hotels or taxis used after an accident. In case of an accident involving your rental car you should contact the nearest police station immediately to fill an accident report and inform the car rental company. The vehicle should not be removed from the place of the accident. The report should state if there was any influence of alcohol or drugs. You should also report any accident or damage to the car rental company. In case of theft, the client is obliged to file a police report and to hand this document over to the car rental company. You should also inform the car rental company immediately about any theft. The documentation and keys of the car should be returned to the car rental company. The client is responsible to check the condition of the car he is receiving in all aspects and make sure that any damages that exist before the pick up are noted on the rental contract. Any damages not noted may be interpreted as the clients responsibility and result in charging the client. Greeka.com will make it best to help resolving any issue with a local car rental agency. Select dates, pick-up location and drop-off location. Provide us with all the necessary personal data. This page is secured (you may check the security certificate) and all data is encrypted. The down-payment required by our partner appears in this page. As soon as we receive your order, our rent a car partner will be informed and he will accept it or not depending on the availability. Greeka.com specializes in Greece and the Greek Islands and is serving thousands of travelers every day. Our company is licensed by the Greek National Tourism Organization with the No 0207E600004722001. Greeka is the most popular website about Greece. The collaboration with selected car rental agencies all over Greece enables us to continuously monitor the market and thus offer you the lowest prices in the market. We know all our partners personally.